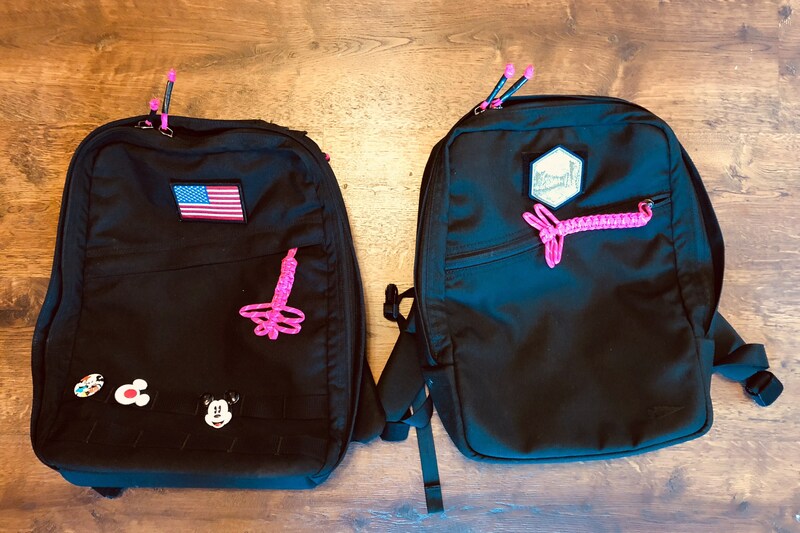 I’ve been impatiently waiting for the day GORUCK released a new kid backpack, so much so I picked up an Echo for my youngest as I couldn’t wait any longer. 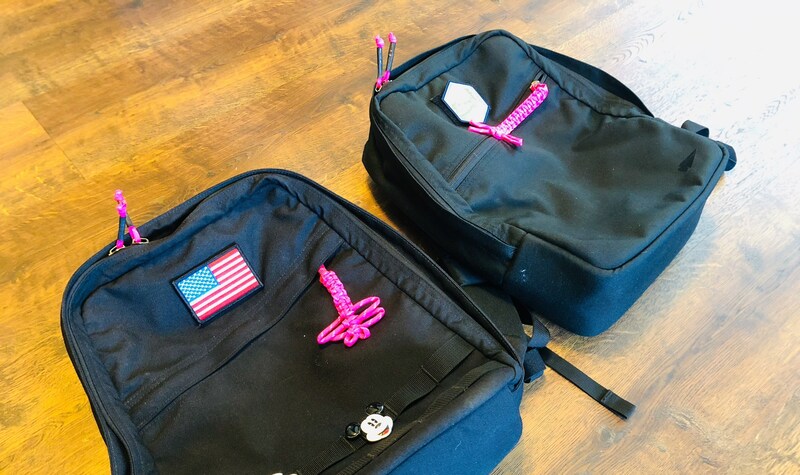 So when GORUCK brought out the KR1 I jumped at the opportunity to snag one for my oldest daughter. However, it’s expensive at $155, so you won’t likely want to buy it. Yes, I mean clearly, but you already knew that. The base of the KR1 is modeled on the Echo, but there’s fairly big changes in the bag itself. The most notable is the lack of MOLLE webbing on the bag. This gives the bag much more subdued look and one which I think plays much better for younger kids. So to is the lack of the webbing with the box stitch at the top attachment on the straps, this tones down the pack quite a lot. Replacing the MOLLE area inside is a large loop fabric area for attaching tons of patches. There’s also an 2×3 patch area on the top inner pocket. The bag is slightly deeper than the Echo which is helpful when you have kids who like to cram bags full. Last up is the 3/4 opening, which means that your kid will never be able to unzip the bag enough that everything falls out. This is mostly good. These are all pretty small changes, but they add up in a big way to make a considerably different bag which is much more attuned for kids. Generally the style and slight addition of depth are huge wins. The 3/4 opening is a mixed offering, but overall it’s better than an Echo for smaller kids. The thing about the KR1 is that it is a compromise in usability. What’s good above can also be seen as bad here. The lack of MOLLE on the bag means there’s fewer areas to attach things for more carrying capacity or organization. There’s no second internal pocket either, which is an odd oversight. 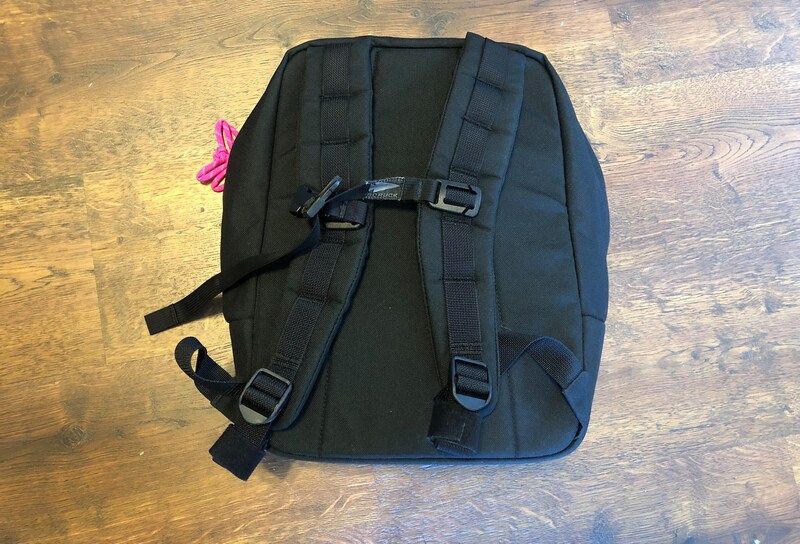 The lack of laptop compartment makes sense for young kids, but they’ll out grow that at some point, and may hinder using the bag both long term, and for travel when iPad packing is a must. The 3/4 opening is also something which will be less than ideal as kids get older — it’s just harder to pack a bag which doesn’t fully open. And yes, there are plenty of adults who use Echos and prefer that size, so it’s not at all out of the question to think the KR1 needs to work long term. Especially given the price. And the oddest choice of the KR1 is the lack of a weather flap over the front slash pocket. Without it, the bag gains nothing in looks, and thus only loses in functionality. I wish they had not made that decision. The strap webbing is much too long for a bag made for kids. 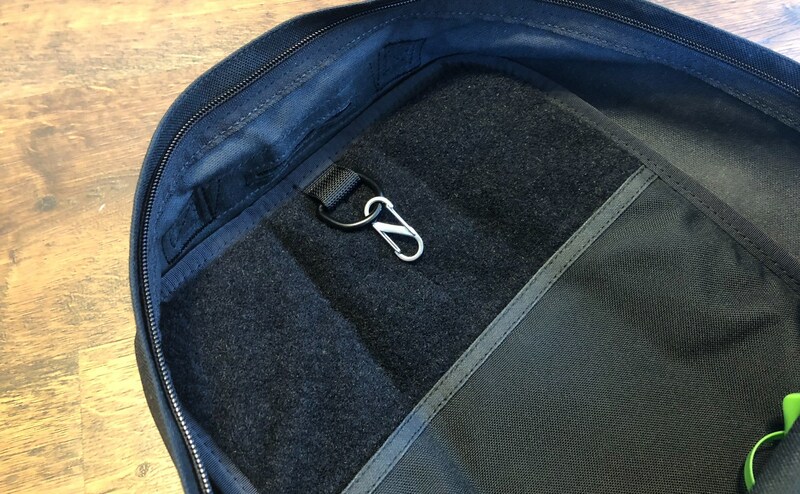 I’ve used some double-sided Velcro strips to roll it up and Velcro them out of the way, but either GORUCK needed to include some webbing keepers, or make them shorter. This is, after all, for kids. But the worst fault of the KR1 as a kids bag is the use of 1000D Cordura. I love 1000D for my bags, it feels premium and is robust. But for kids? 500D would have been a far better, and lighter choice — perhaps with spots of 100D where wear and tear happen the most. The only complaint I ever hear from my daughter is that the straps are stiff still. That’s after over a month of daily use. The Echo is a far better bag overall, and is more versatile generally. But the Echo looks more tactical and less kid like than the KR1. So what this really is going to come down to is how long you want your kid to be able to use the bag. I don’t think either would be too small — because I know I could have used it even into college at that size. What’s really going to curb usage long term is personal preference or the sheer lack of versatility in the bag. The problem though is that the Echo is $295, whereas the KR1 is/was $155. I think the Echo is a much better bag, but not at almost twice the price. 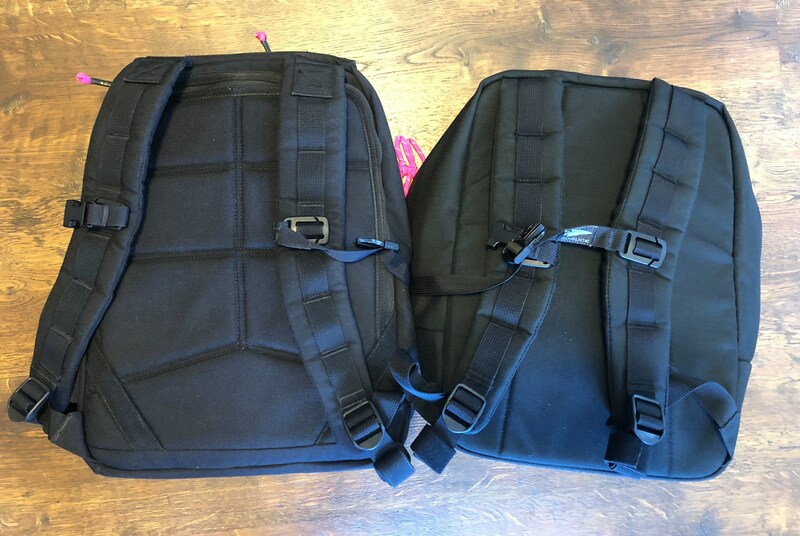 Alright, forget about comparing the KR1 to other GORUCK bags, and talk specifically about comparing it to other kids bags. I’ll compare it to The North Face Mini Berkeley that my oldest also has: the KR1 is better and she likes it better. The straps sit much better on her back, it doesn’t pull her backwards when it is loaded, and it offers much better organization. However, it packs smaller. In every way, the KR1 is the best kids backpack I’ve found. You just have to be willing to spend $155 for it. Is it worth it? Yes, but only if you want to buy your kid a backpack once and then forget about them for years to come. My kids have really gotten into the morale patches. So be prepared to buy lots of those. I buy new ones seemingly weekly — they love swapping them out on Monday’s before starting the week. The ultimate kids backpack is here.